A fresh-tasting energy drink enriched with, among other things, vitamines B6 and B12 which helps combat a feeling of tiredness. 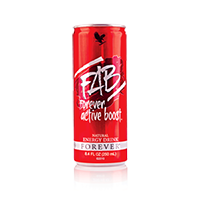 FAB is a quick and easy way to immediately boost your energy levels. Please note: high in caffein (28 mg/100 ml). Not recommended for children and pregnant women.